Your world revolves around your preschooler. You’re constantly concerned about his or her safety and proper development. You work hard to provide enriching and fun opportunities such as sports, clubs, classes, lessons, and more. With all the hustle and bustle, it’s easy to miss out on opportunities to actually bond with your preschool child. These 12 ideas will help you slow down a little, connect with your preschooler, and form a happy, healthy bond that will carry you through all the ups and downs of parenthood. Spending time in nature has been shown to reduce stress for children and adults. Connect with your preschooler on a hike in the forest, at the ocean, or some other place in nature. Letting go of stress together will give you both opportunities to appreciate your surroundings and each other. Children communicate through play. If you really want to know what’s going on in your preschooler’s world, play with him or her. Lost your imagination somewhere between childhood and parenthood? You’re not alone. If you don’t know how to play, just follow your child’s lead. 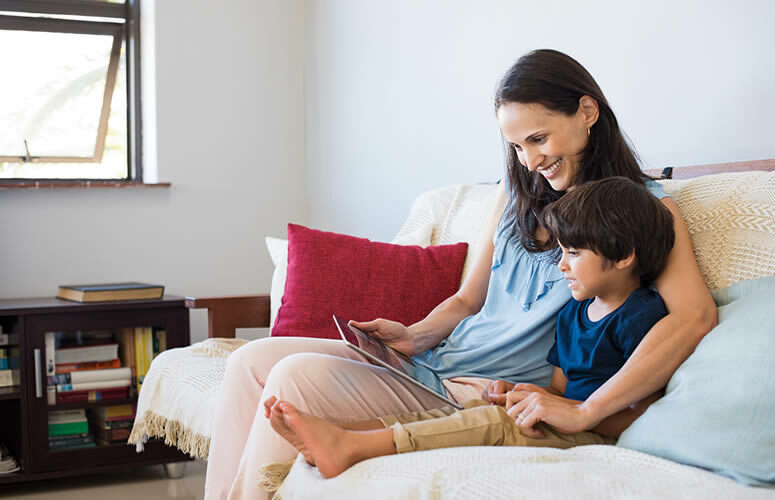 Sitting next to each other while you share an enjoyable story will help you and your preschooler bond, and it will also give you topics to discuss at other times. Physical touch brings feelings of love to the surface. When done respectfully, your hugs and playful wrestling can help you and your preschool child feel a safe and secure connection. Put down your phone, and listen when your child talks. Making eye contact and truly listening (not just waiting for him or her to finish so you can go back to what you were doing) will show your preschooler that you care about what he or she has to say which will build trust and love. There’s something about putting one foot in front of the other that gets the brain going and the conversation flowing. Spending time together on a walk takes you away from the instructor/student role we so often slip into as parent and child and allows the two of you to just be together. If your preschool program permits it, volunteer in the classroom or on field trips. This won’t give you one-on-one time, but it will give you a view into a part of your child’s world that you are normally absent from. Pass a notebook back and forth to each other. If your preschooler can write, give him or her small prompts about things to write about. If your child can’t write, ask him or her to draw a picture instead. Respond with your own simple words or picture, and pass it back and forth throughout the week. Everyone loves food and creating your child’s favorite dish together will delight your preschooler. And taste testing should definitely be permitted! Children love to be creative and will welcome the chance to be creative with you. Find a craft that won’t frustrate you or your preschooler, and block off an hour on a weekend afternoon to make something fun together. Preschoolers love to learn rules, and they love the thrill of a chance to win! Pull out a simple game or puzzle, and spend some time playing together. Many bonding moments pop up organically, but scheduling doesn’t hurt. It actually helps. Create a standing date once a month with Mom or Dad so your child can look forward to together time and feel important. Time is one of the greatest gifts you can give your preschooler. You’ll never regret making time for bonding activities with your preschooler, and this will help form important bonds that will last a lifetime.